Isabelle Kelly has fired the Australian Jillaroos to a thrilling 26-24 win over New Zealand in their women's rugby league test. The superstar centre produced two pieces of brilliance on Saturday including the 75th-minute match winner to get the world champions home against an injury-hit and gallant Kiwi Ferns at Auckland's Mt Smart Stadium. 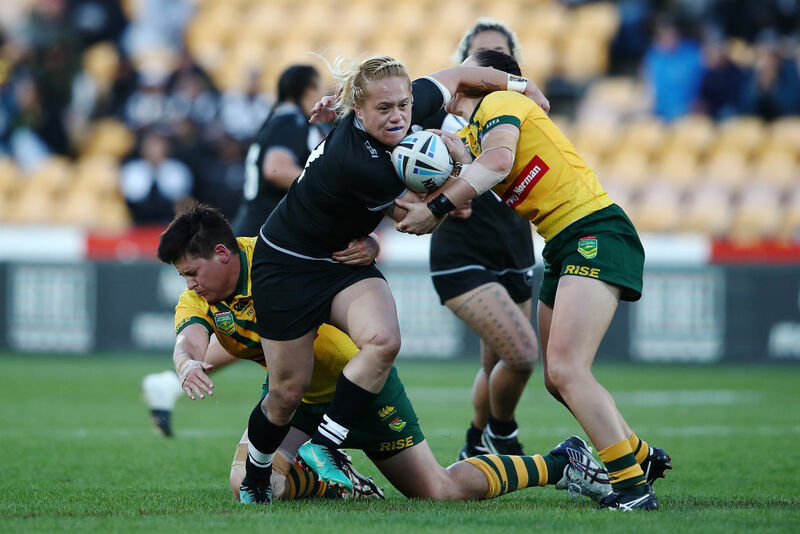 Despite losing halfback Kimiora Nati (knee) and co-captain Laura Mariu (shoulder) either side of halftime, the New Zealanders refused to yield, pushing the Australians all the way in a see-sawing second half. "We could call it a scare," Jillaroos coach Brad Donald said. "The girls have come out of a premiership (NRLW) where they only played 60 minutes and we knew it was going to be tough. "We knew it was going to come down to the last five or six minutes. "It was one hell of a game and one hell of a performance from both sides and showcased how good women's rugby league is at the moment." The Jillaroos were forced into a last-minute backline reshuffle after losing Jess Sergis (knee) but still looked crisp. Retiring prop Heather Ballinger went out on a high, earning player-of-the-match honours. The Jillaroos burst out of the blocks to be up 12-0 after 12 minutes with Ali Brigginshaw setting up Julia Robinson before doing it all herself. The Kiwi Ferns were often their own worst enemies but managed to get on the board before the break when Raecene McGregor lofted the ball out to Langi Veainu. Nati was helped off just before halftime with what appeared to be a serious knee problem however five-eighth McGregor stepped up to keep her side in the game. The Australians also lost back-rower Kezie Apps to a knee injury. The two sides traded tries in the second half and, when a rampaging Maitua Feterija managed to get the ball down in the corner, the scores were locked at 18-18 to set up a grandstand finish. Kelly then broke the game open when she ran through Nita Maynard to race 70 metres to score however, importantly, Chelsea Baker missed the conversion. After Brigginshaw dropped the ball from the kickoff, it put the Jillaroos under pressure and Amber Kani produced some late footwork at the line to go in between the uprights to go in front 24-22. But as the New Zealanders looked like they might steal it, the Jillaroos spread it right and Kelly crossed with five minutes remaining to hoist the trans-Tasman Trophy. "We can say it's one that got away," Kiwi Ferns coach Kelvin Wright said. "But there are moments that got away from us. The first 10-15 minutes came back to haunt us a bit. "We can't take anything away from my girls' efforts. They left everything out there."